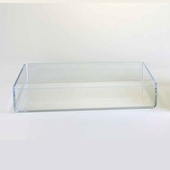 This unit features one-piece bent trays without dividers, and has three tiers, in two different widths. All units pack unassembled for easy shipping and come with transparent two piece fasteners for assembly. MRK2 : 6-3/4in.H x 12-3/8in.W x 11-7/8in.D. 3 tiers. Each tray is 12in.W x 2in.H x 4in.D. MRK1 : 6-3/4in.H x 18-3/8in.W x 11-7/8in.D. 3 tiers. Each tray is 18in.W x 2in.H x 4in.D.